2009/11/20 - got Restricted Area Permit to Nagaland. Doors are opened. 2009/11/16 - got visa 5 days ahead. Got to embassy, was told its not ready yet, after 15mins got call again that my passport is ready. What a service! Another great experience with embassies in general. 2009/11/10 - approximate plan of our trip. 2009/11/08 - decision was made, tickets were bought. North East India or so called Seven Sister states has appealed to me for a long time. The problem is, some states, the most interesting ones, are under Restricted Area Permit. You have to travel in group of four or as a married couple to get the permit. The positive side of the permit is, that not many western tourists are able to reach this place. The main focus of my travels is the Nagaland tribes, whose members were not so long ago headhunters. If I manage to get there in time, Cham dance - the most significant event in Sikkim - could be definitely the highlight of the tour. Check out list of articles which I published (mostly in czech language). Learn some Hindi. Comes handy in rural Assam and Rajasthan, not talking about much easier contact with locals all over India. Be careful on New Delhi train station. I've seen bags stolen while boarding morning train. And have heard couple of stories (from women) that they were denied access to the international tourist bureau (1st floor) by stuff (!) working at the train station. Don't trust anyone you meet at the train station before you reach the international tourist bureau. Even if they push you, tell you its closed, whatever..
Assam and whole north-east is generally safe but check latest news on the inet (The Assam Tribune, etc.) since there comes very little information to the west about this area in general. If locals tell you its time to leave, this means its really time to leave. 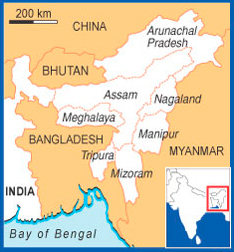 Nagaland is at the moment (Dec 2009) very safe. Beware of often strikes in Darjeeling area (Gorkhaland). Especially if you plan on visiting Sikkim on tight schedule - if the Ghorkhas come suddenly with a strike, you are stuck in Sikkim and can not travel out by bus or shared jeep. The only option is pricey helicopter to Bagdogra, which at strike days fills in very quickly. Also beware that the way to Bagdogra airport is a popular place to strike, so be sure to start your journey to the airport well ahead in case you have to take other way to get there.